1. Preheat the barbecue (or griddle/grill). Toast the bread on both sides for 2-3 minutes until browned. Rub one side of each slice with the cut side of the garlic clove, drizzle with half of the olive oil and season. 2. Cut the halloumi into 8 slices and the figs into quarters (or halves if your barbecue grills are set wide apart) and lightly brush with olive oil. Cook the halloumi and figs on the grill for 3-4 minutes, turning once, until the cheese is softened and nicely charred with grill marks and the figs are tender and juicy. 3. 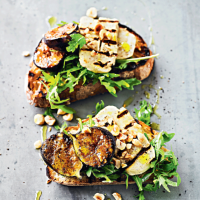 Arrange the salad leaves on the toasted bread, top with the warm halloumi and figs and scatter with hazelnuts. Drizzle with extra virgin olive oil and balsamic, season and serve immediately.